Whether it’s a dinner or cocktail party, Friendsgiving, or a weekend stay, you should never show up empty handed! 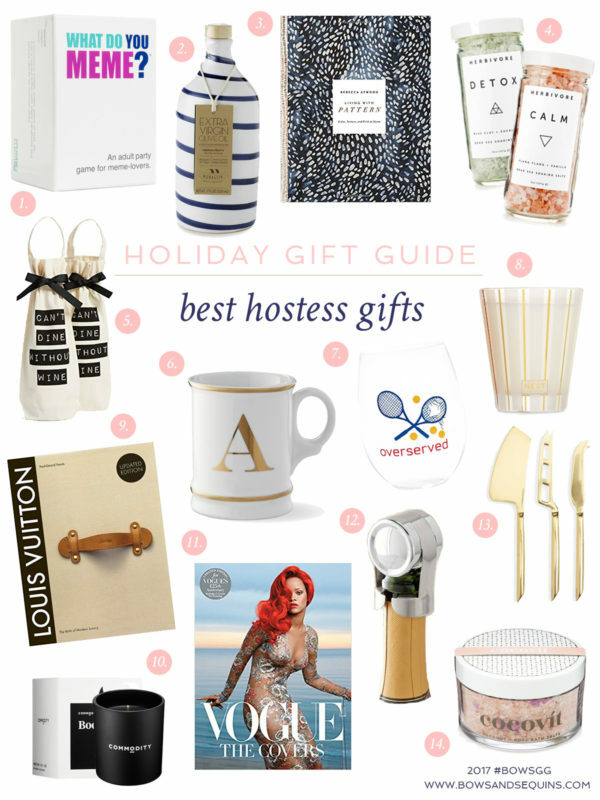 A thoughtful hostess gift never goes unappreciated. If you don’t know the host that well, you can’t go wrong with fresh flowers in a beautiful vase, a bottle of wine, spirits, or champagne, luxurious hand soap & lotion, or a nice candle (bonus points if you include chic matches). If you have a feel for your host’s interests, taste, and humor, feel free to have a little fun with it. Some of my favorites include group games, coffee table books, something with a funny phrase, high-end olive oil, or even bath salts to destress. If your host is a millennial that’s into memes, this is a great option. I got Hallie this What Do You Meme? Game last year and it’s so fun to play… It’s basically like Cards Against Humanity, but there will be a popular meme that you’re matching your phrases against. Highly recommend! In both Italy and Croatia, I’ve sent a few bottles of local olive oil home and it makes cooking that much more fun thinking about my trip(s). (And even more delicious, duh.) If your host knows his or her way around the kitchen, a nice bottle of olive oil is a welcome departure from a bottle of wine. And they’re sure to get a lot of use out of it! Williams Sonoma, Sur La Table, and heck, even Amazon, all have nice bottles if you don’t have a chance to run to Eataly and test a few yourself. I so need some detox bath salts! The meme game looks fun as well!